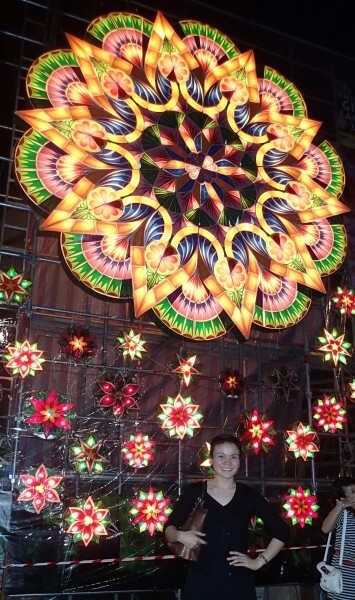 Parol is the most popular ornament in the Philippines every Christmas season. It symbolizes the star that the three wise men followed to the manger. Lanterns also signify Christ being our light. It used to be the cheapest Christmas décor, made of just bamboo sticks and papel de japon, a family could hang outside the window of their houses. Now it has evolved into something more grandiose made of multi-coloured capiz shells or fiber glasses with thousands of dancing lights. Truly, star-gazing, is more fun in the Philippines. A giant parol made in San Fernando, Pampanga, Philippines was brought to Singapore for display at the Cathedral of the Good Shepherd, first time this has happened in Singapore and I wanted to take part. With the help of Windel, I volunteered to become an usherette. I was supposed to be there to help at the same time, witness the lighting up ceremony but I was not able to do my job because I guess the VIPs didn’t really need to be ushered because they already knew where to go and also, there were enough people already helping there; hence I just completed my second reason for going, to witness it being lit up. This entry was posted in Uncategorized and tagged alone but not lonely, churches, happy. Bookmark the permalink.